Three hundred days of sunshine a year. That’s what they say about this area of Oregon. And I guess it’s true. But in January, it’s common to have low clouds and fog that obscures the view of the mountains. On a clear day, a hunter can see Mt. Hood and Mt. Jefferson to the west and, to the north, Mt. Adams and Mt. St. Helens. To the east, the Ochocos are visible. Ranchlands stretch in every direction, with fields of rye and wheat and sagebrush in the canyons. The ground we hunted is owned by the Justesen family. Their land is planted with rye and wheat and other crops. For nesting and shelter habitat, the canyons and draws are planted in blends of rye, alfalfa, canola and native grasses. CEO Hunt Club was founded in the late 1990s by Bob Krein (see 2013 Sage Canyon report) and Krein continues to work with the Justesens both in consulting on habitat and referring upland bird hunters, waterfowlers and big game hunters. For this hunt, we contracted with Jeff Miller, a well-known Oregon outfitter (see Field N’ Marsh 2012 wild turkey report). 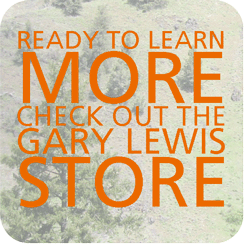 Field N’ Marsh Outfitters offer upland bird, waterfowl, turkey and big game hunts in Oregon and Washington. We hunted chukar (released), and pheasant hunting is available, but there are wild birds to hunt too. 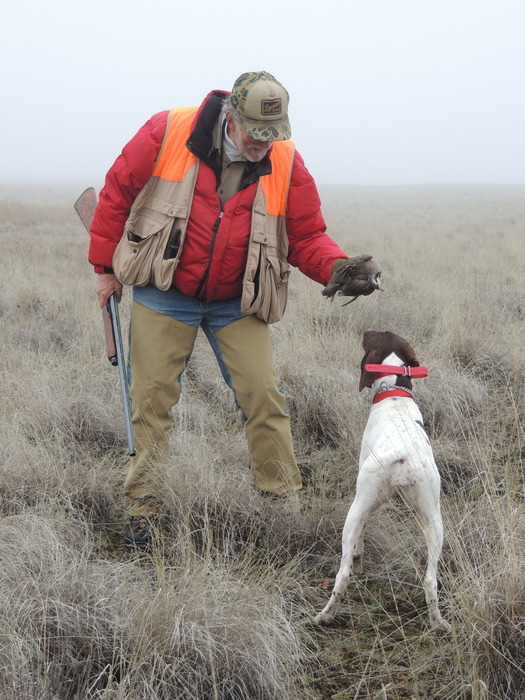 Hungarian partridge and chukar are found in the flats and in the canyons that lead down to the Deschutes River. We met after noon at a clubhouse on the ranch, signed in and started into the field. We were training two dogs, my pudelpointer and my friend’s German shorthair. Both dogs were a year-old and wanted to learn to work together. This opportunity was exactly what they needed. Miller kept a German shorthair in reserve in case our dogs needed help. They didn’t, but we turned him loose to give our dogs more experience. The birds were strong flyers and the dogs made a lot of progress. We heard wild chukar calling as we were leaving the field. CEO Hunt Club is comprised of three licensed preserves which were started soon after Oregon’s preserve system was established. While there is good opportunity for the upland hunter, this property really shines for the waterfowler. The Justesens have tapped wells that feed 30 ponds and lakes on their holdings near Grass Valley and Tygh Valley, to the west. Ducks and geese spend the winter in this part of Central Oregon and the numbers have been improving every year, in part to changes in the patterns of Pacific Flyway waterfowl and because the Justesens have provided such good habitat. There are blinds at many of the lakes and the Justesens do not permit their hunters to jump-shoot. The upland bird preserve season opens August 1, but hunting doesn’t begin until September when the weather cools. The season lasts through March. A full day guided hunt (8 pheasants or 13 chukar per hunter) includes lunch, snack, guide and dogs. The cost is $350 per hunter, minimum two hunters. A half-day guided hunt costs $225 per person (minimum two hunters)­­­­ and includes release of rooster pheasants or chukar, a guide, dogs and bird cleaning. An overnight stay and hunt costs $400 per person and includes lodging at a bunkhouse, breakfast and lunch. For a full day unguided hunt, the cost is $295 per hunter with a two hunter minimum. Field N’ Marsh also provides dove hunting in September at $150 per shooter. In season, goose and duck hunts can be combined with upland bird hunting. With 30 ponds and lakes (the largest is 18 surface acres) on the property, there is a fly-fishing opportunity as well. For a late-summer, early fall trip there is an option to add on whitewater rafting in the nearby Deschutes. Sage Canyon River Company offers river trips through the month of September. The Justesen ranches also offer deer and elk hunting. Other recreation options in the area include birding and wildlife watching. There are a variety of lodging options. The first is a bunkhouse that was converted from a grainery. It sleeps four people and has a kitchen and a big screen TV and is decorated with implements from the old day. An off-property option is a comfortable small house in the town of Grass Valley. For groups that need more room, there is a luxurious lodge on the White River in nearby Tygh Valley. The traveler could also stay in the town of Maupin at the Imperial River Company hotel. Grass Valley, by the way, is a small farming community and there is a café and a gas station and a lot of days neither one is open. If groceries are required, they should be purchased in Madras, Maupin or The Dalles. Hunters can fly into Redmond (93 miles away) or Portland (120 miles) and rent a car for the drive to Grass Valley. All services are available in The Dalles, which is about 50 miles away.